This special issue brings together essays, poetry, and art that offer insight into what further conversations ecocriticism can develop, addressing questions of space and place, human-nonhuman divides, and how the material world can interrupt and reconfigure notions of human and nonhuman ontology, agency, and cultural formation. Contributors include Karen Barad, Lawrence Buell, Alenda Y. Chang, Gilles Clément, Katrina Dodson, Craig Dworkin, Brenda Hillman, Alastair Hunt, Stephanie LeMenager, Timothy Morton, Harryette Mullen, Joan Retallack, Simona Schneider, Jonathan Skinner, and Sunaura Taylor. 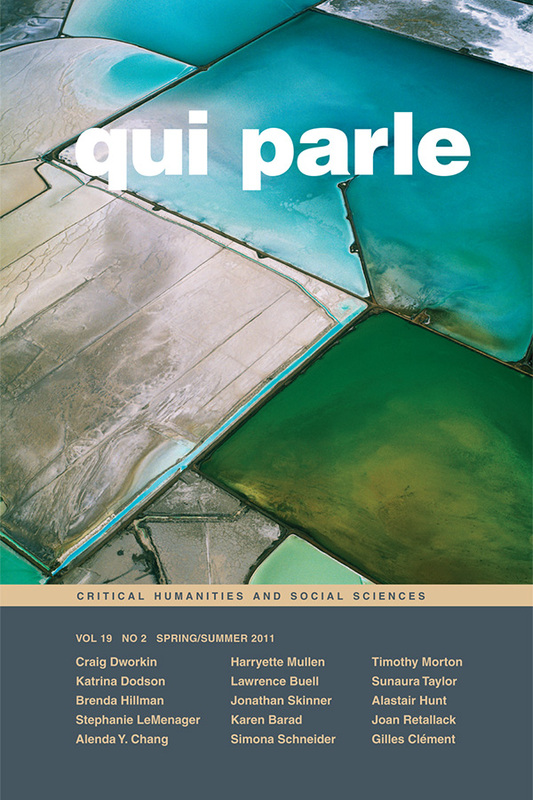 View the table of contents for Qui Parle 19:2, at the journal's online site.